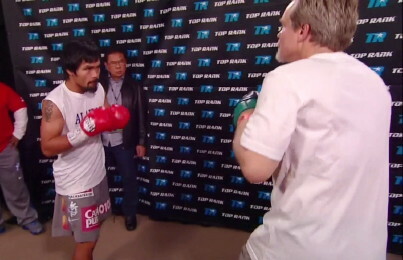 How will Manny Pacquiao and Floyd Mayweather be remembered? By Mark Havey: Boxing is defined by legacies. History has been kind to some, harsh to others, and some left forgotten. This era we have been fortunate enough to have two dominant champions in the same weight. Manny Pacquiao and Floyd Mayweather have had everyone talking. What does the future hold for their reputations. In years to come people will certainly remember the Pacman. He has been named the fighter of the decade and won fighter of the year numerous times. He spent four years as ring magazines pound 4 pound best fighter on the planet, he won 2009 KO of the year when he sensationally stopped Ricky Hatton in 2 rounds. Pacquiao is also the only man to win 10 world titles in eight weight divisions. The help he has given to the poor also goes far beyond kindness. Not necessarily boxing related, but still very relevant to Pacquiao’s legacy in the same way that racial acceptance is accredited to Muhammad Ali. His dominant style combined with his humble nature have made him an idol. The out spoken and ultra confident Floyd Mayweather will also be remembered. A five division world champion winning the lineal title in three of those. Mayweather has won 8 titles in all. Winning 1998 and 2007 fighter of the year proves just how long Floyd has been at the top. He has had his fair share of time as the pound 4 pound best and there are some who say he still is. In 1996 Mayweather won a bronze medal in the Atlanta Olympics. His KO against Hatton was also voted the best of the year in 2007. In 2012 Mayweather was named the highest earning Athlete of the year. Widely regarded as the best counter puncher in the world, some say the best ever. There are fans who are obsessed with certain boxers. They don’t really care about boxing. They claim to be true fans of the sweet science. They will also tell you that one will be remembered as a great, whilst the other will be remembered as overrated and irrelevant. Don’t believe them. The points I have made for each fighter do not scratch the surface. Their achievements are so plenteous it could fill a book. Most boxing experts put both men in the top 100. Even Muhammad Ali wasn’t fully appreciated when he was around. Time will push Floyd Mayweather and Manny Pacquiao way up the list. The one bad point they will be remembered for is failing to fight. But even that has got new fans talking about boxing. Here the main things I will remember about each fighter. Mayweather for being the best counter puncher I have ever seen. A genius in the ring, his defense has frustrated so many great fighters. Pacquiao for so many great wars and knockouts. A devastating puncher who has made the toughest of men seem frail, whilst completely dominating them. Boxing » Floyd Mayweather Jr » How will Manny Pacquiao and Floyd Mayweather be remembered?